Florida State University mascots, Chief Osceola and Renegade, at a home football game in 2008. Courtesy of Wikimedia Commons. That’s the rare case presented by Florida State University (FSU) and its Seminoles mascot and Chief Osceola emblem. 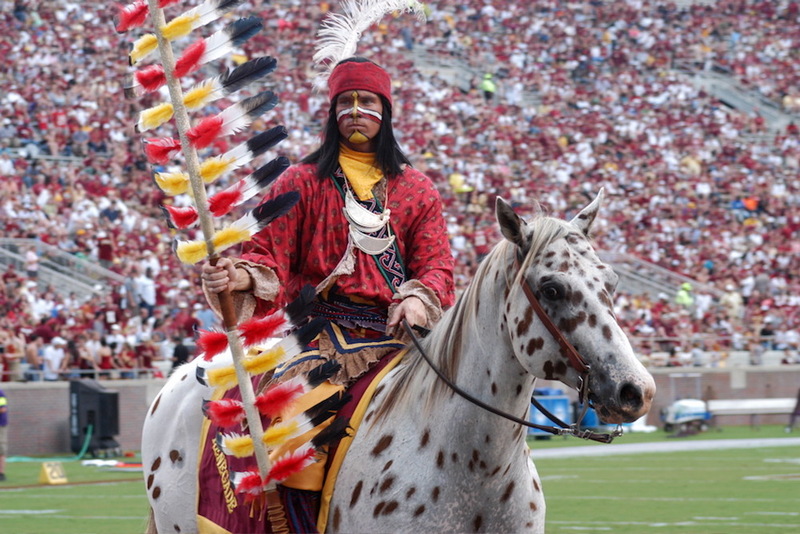 FSU’s mascotting situation is unique in that its school and teams benefit from a special relationship with an indigenous nation, the Seminole Tribe of Florida (STF). The STF has cosigned FSU’s mascotting practices for over 40 years, thus providing credibility that most teams and schools simply do not possess. This situation may be special, but it still illustrates one of America’s longest-running cultural debates: the factors influencing the line between the acceptability and offensiveness of Native American mascots. Such mascots were once commonplace and rarely questioned. Native American mascotting culture arose at the turn of the 20th century once most indigenous nations were on reservations following the close of the Indian wars. Such nations’ symbols became safe to appropriate at that point, and helped the burgeoning imperial nation sow its roots in nature and in frontier-like bodily performance. (The latter was also seen played out in Boy Scout culture, the rugged cowboy persona of Theodore Roosevelt, and in advertising for masculine products like tobacco and cars). “Playing Indian” in these ways connected with stoicism, fortitude, honor, and physical prowess. These qualities translated seamlessly to sports competition, thus the increase of Native American mascots. With indigenous numbers having dwindled and reservations spatially separated from metropolitan areas, resistance to such mascots was slight. That changed in 1968, when the National Congress of American Indians publicly critiqued the practice of mascotting as detrimental to indigenous communities. Since that time, and across the expanse of professional, collegiate, and even high school sports, a controversy has raged over the meaning of such mascots. Do mascots honor Native American cultures or stereotypically misrepresent indigenous people, thus continuing the debilitating work that colonization started when Europeans began settling the Americas? As researchers and authors, we’ve examined the unyielding positions of those on both sides of mascot questions and the debate’s various counterpoints: honor versus hate, valor versus colonialization, stoicism versus violence. We’ve also sought to get beyond the pro and con arguments to understand what the conversation around the issue means. We’ve analyzed a national survey of fans and gathered a trove of public documents from teams, fans, and Native and non-Native activists to explore the primary rhetoric of parties involved in the controversy. Some well-known cases of offensive mascots are easy to understand, in particular football’s Washington R-dskins, who have made a brand identity from a racial slur so offensive that we don’t spell it out fully in our published works. But others are not so clear-cut, and raise complex issues of history, consent, and culture. The question of Florida State and its “Seminoles” offers one such multifaceted case. So deep is the relationship between FSU and the Seminole Tribe of Florida that when the National Collegiate Athletic Association issued sanctions on schools with Native American mascots in 2005, FSU received an exemption. Unlike the University of North Dakota Fighting Hawks (née Fighting Sioux), FSU did not have to change its mascot name; and unlike the University of Illinois Fighting Illini, FSU was not compelled to retire its visual imagery (i.e., Illinois’s Chief Illiniwek logo) and its rituals (i.e., Illinois’s halftime “crazy dance”). FSU kept the name “Seminoles” intact along with Chief Osceola as a visual and the “tomahawk chop” as a performance. FSU’s integrity and authority, however, do not stand unchecked. The much larger Seminole Nation of Oklahoma does not support FSU’s mascot. Moreover, other Native nations disagree with the imagery shrouding the Seminoles moniker. These other indigenous communities argue that FSU began mascotting the Seminoles well before the STF issued an agreement and that said agreement only came to pass because of political and financial ties. So who decides whether a mascot name, visual representation, or ritual can stand or be excised from sport culture? Fans? Native Americans? Teams and schools? Who can represent Native Americans writ large or within a particular tribe? Those tribes closest to the school? The answer is far from clear. Schools and teams purport to own and control their mascots. They trademark them, relying on Western law to trump Native cultural connections to these symbols. They pack them full of traits with which they and their students and fans may align. And this, in particular, is what inflames anti-mascot activists, who view such control as a repeat of colonial history; that is, in the same way that Native land was taken by non-Natives throughout U.S. history, so too are mascots said to be symbolically stolen from Native Americans. Ultimately, mascot debates have been contests over public opinion, and here the picture is more complicated, because opinion depends on context and specifics. In our surveys, sports fans think and feel differently about the FSU mascot depending on the rhetorical form that the mascot takes. In a survey, fans generally found the name “Seminole” (6.73 on a 10-point scale) and the mascot’s spear logo mostly acceptable (6.98), but had more difficulties with the Chief Osceola logo showing an actual Native American face (5.42). And the rituals at FSU—the “tomahawk chop” (5.05) and the “war chant” (4.75), in particular—were more likely to be seen as offensive. By and large, Americans have come to acknowledge that there is something questionable about using Native American mascots. In the least, the issue is certainly on the public’s radar. Thus, when it comes to how mascots represent Native Americans, people are not “all in” or “all out.” The U.S. public does not debate all the rituals of the Washington R-dskins team, but rather the name itself, given that the word “r-dskin” has been used as a racist epithet for two centuries. In Cleveland, it is not the name “Indians” but rather the caricatured “red face” of the Indians’ Chief Wahoo logo that has drawn ire, so much so that Wahoo was retired by the Cleveland franchise as of October 2018. The mascot debate is not just about cultural representation, but also about cultural politics in terms of who has the authority to change mascots and what it could mean for fans. While teams worry that abandoning a mascot will alienate fans, we found in our research that fan culture and devotion does not usually change when a mascot is retired. Fans at FSU reported that, yes, they would be upset if Chief Osceola was remanded to the sidelines, but that they would still watch games. The real issue, it seemed, is that fans specifically said they’d be angered by the perception that such a change might be precipitated by “political correctness.” Similarly, University of Illinois fans, whose Chief Illiniwek was removed in 2007, reported some 10 years out that their fandom was unchanged a decade later. But, they still lamented that “political correctness” had run amok. Further comments revealed that their underlying complaint was the shift in the balance of power that organized opposition to the mascot indicated. One wrote “No! Tired of minority people getting catered to.” In this sense, the mascot controversy has come to mirror wider political polarization in the US, with no one embodying the “stoicism” that the mascots supposedly symbolized. Jason Edward Blackand Andrew C. Billings are the authors of Mascot Nation: The Controversy Over Native American Representations in Sport. Black is professor and chair of communication studies at the University of North Carolina at Charlotte, and Billings is professor of journalism and creative media at the University of Alabama.